Ides of March Andrew Wyeth N6055 Image: 19 3/4 x 33 Details: Framed:37x25 Custom Framed Double Matte: Dark Grey & Off-White Professional Ornate Black Wooden Moulding The prints we carry are produced using either the lithographic or serigraphic printing process, and are printed on high quality archival acid free paper. Most prints are on a thick (120 pound or higher) stock of paper. 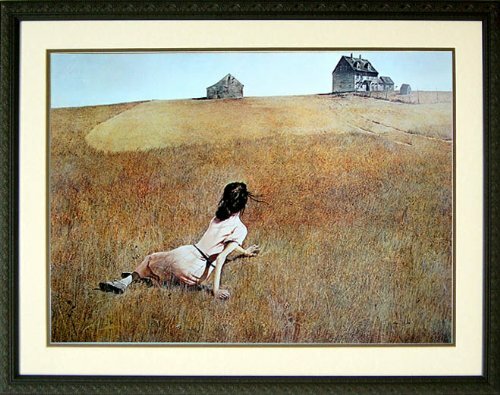 About The Artist: Andrew Newell Wyeth (born July 12, 1917) is an American realist painter, one of the best-known of the 20th century. He is sometimes referred to as the "Painter of the People" due to his popularity with the American public. Wyeth's favorite subject is the land and inhabitants around his hometown of Chadds Ford, Pennsylvania, and those near his summer home in Cushing, Maine.